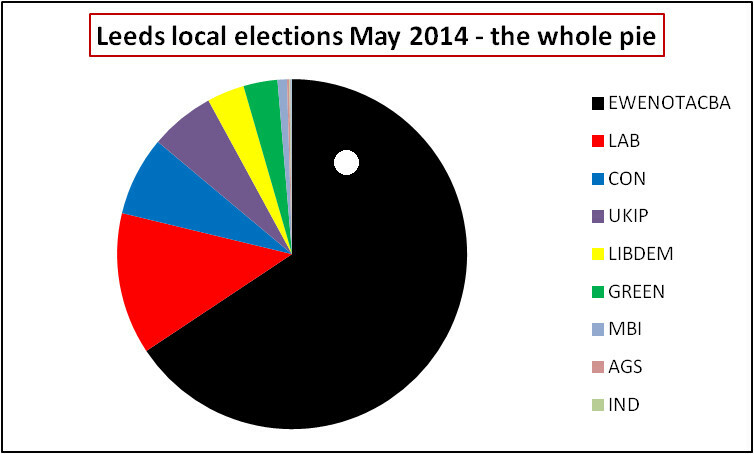 No biggie, but amongst all the wailing and crowing and heart-searching over Thursday’s local elections, they all seem to be looking at the wrong chart. 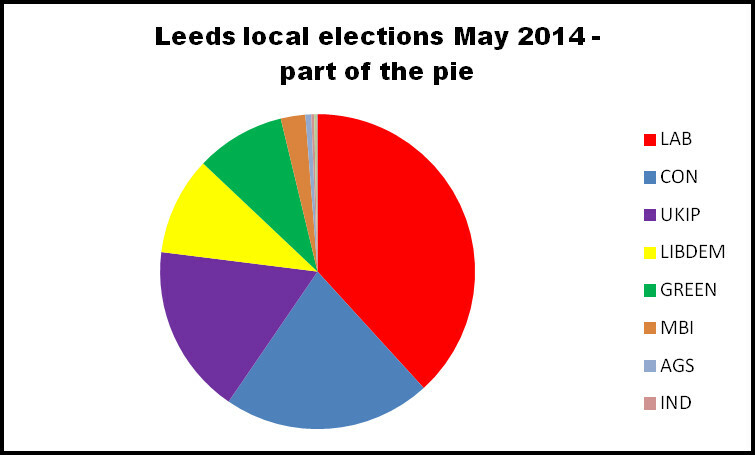 Here’s the Leeds version of the one they’re poring over, showing the parties’ percentage share of the vote. Plenty to squabble about there. But it’s only part of the picture. What’s not been taken into account are the three groups operating under the glorious EWENOTACBA alliance: Elections, What Elections? (EWE), None Of The Above (NOTA) and Couldn’t Be Arsed (CBA). Which makes the full pie look a bit different. Strange that this one doesn’t provoke any wailing or heart-searching. This entry was posted in Uncategorized and tagged EWENOTACBA, leeds, local elections, May 2014. Bookmark the permalink. And that doesn’t include people not registered to vote, estimated at six million nationwide by the Electoral Commission a few years ago, ten per cent of the population. I haven’t returned my voter registration form for three years, but I am still on the register and still get the voting cards. 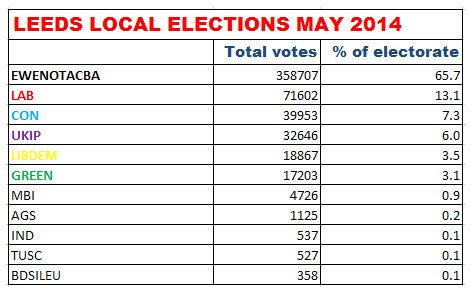 The voting system is so insecure it is laughable. If I had moved out of this flat somebody else could have moved in be voting in my name as well as themselves. Ha, interesting chart. I remember sitting in my garden and having a chat with a fellow coming back from the pub pissed who was certain the way to sort out politics was to have the seats in parliment empty if less than 50% of the electorate turned out. I’m not so sure on that. I much more prefer the idea I heard was being thrown aroud occupy Greece on the grape vine. That if less than 50% of the electorate turn out you give the post to someone picked off the electoral register at random, unless they decline, in which case you choose someone else at random until you find the person. Only if I’m allowed on the expert panel. Don’t forget “MVDMABBOD” – My Vote Doesn’t Make a Blind Bit of Difference. 21 of 33 wards on Leeds City Council have been represented by candidates of the same party unbroken since 2004 (when there was the last set of boundary changes). Of the 12 where seats have changed hands, six (Garforth and Swillington, Gipton and Harehills, Hyde Park and Woodhouse, Moortown, Roundhay, Temple Newsam) can now also be described as safe Labour seats at least in the short term, while Farnley and Wortley (only won once by Labour in a General Election year) and Morley South (swung strongly back to Morley Borough Independents since Labour won in 2011) appear to be safe going forward. That leaves just four seats (Burmantofts and Richmond Hill, Headingley, Horsforth, Rothwell) where there is actually any real chance than a vote might make the difference. Of the 29 now safe seats, 18 are Labour held giving a guaranteed 54 seats and no chance of any other party gaining any power on the Council. Really then, what is the point in voting? Welcome, MVDMABBOD to the grand alliance formerly known as EWENOTACBA. 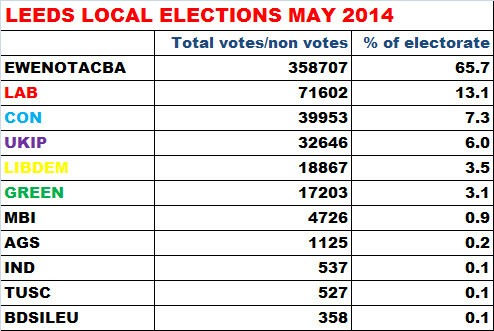 Occurred to me the other day that the Voting is Compliance (Russell Brandist Faction) are missing too. So, it’s now the EWENOTACBAMVDMABBODVICRBF alliance. Who needs snappy acronyms when you’re the majority?